why care about old-fashioned breeds of livestock? You remember Cat don’t you? Well, he magically appeared one day when we were working on fences. He jumped right into the job and wasn’t taking no for an answer. He decided he was staying whether we wanted him or not. From the start, I thought he was a little unusual, but as he’s getting older, just how unusual is being revealed. Cat squeezes every scrap of enjoyment from life. He makes friends easily and does not discriminate. He’s smart, independent and entertaining. He expects the best from life, and so far his strategy seems to be working. Even Ellis the Destroyer can’t find a single reason to dislike Cat. 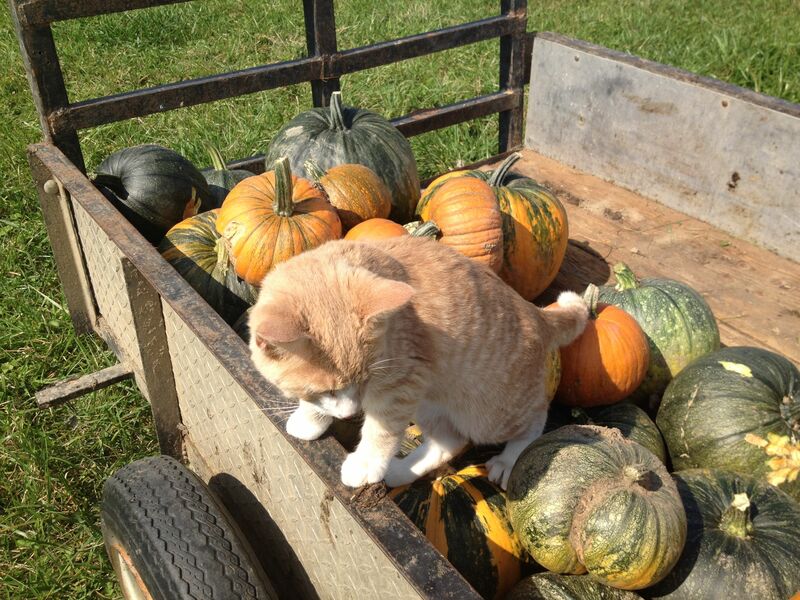 And, Cat loves farm chores. He waits by the gate every morning for breakfast, then he likes to ride along for watering rounds. He’s happy riding wagons, tractors and four-wheelers securing himself by snuggling tightly into your lap, completely relaxed and taking in the scenery. 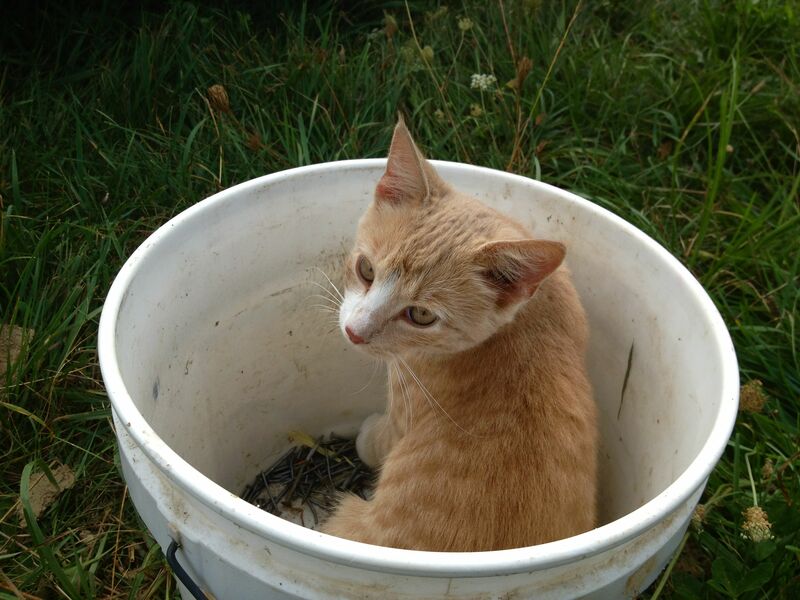 He enjoys working in the barn, fixing fencing and garden chores are his favorite. 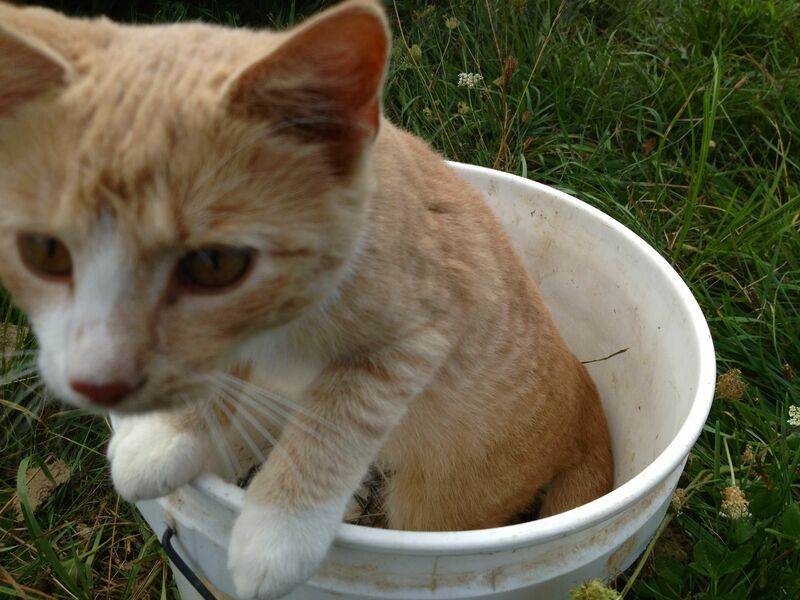 He comes along for mechanical chores like weed-whacking but is smart enough to stay out of the way. When I’m engrossed in some task, he still hangs around nearby but Cat has no trouble entertaining himself. 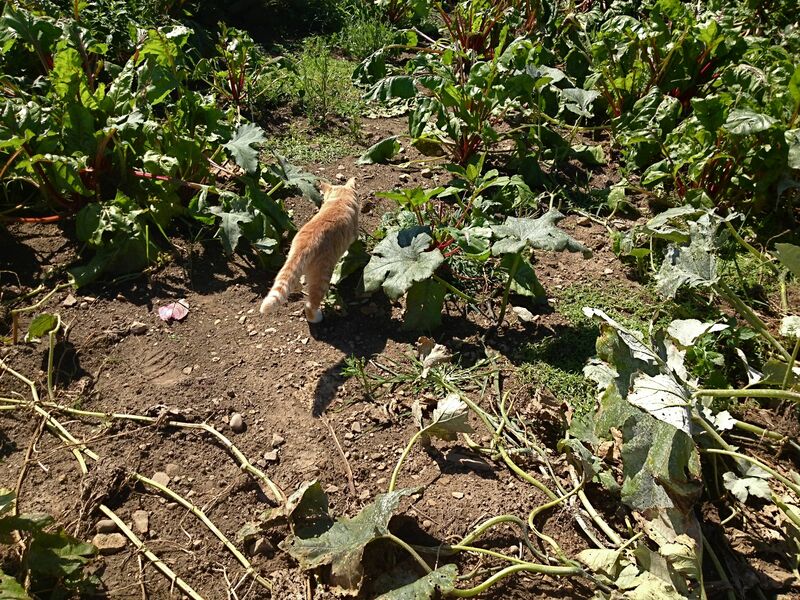 He’s an excellent hunter and avid student of burdock and butterflies. 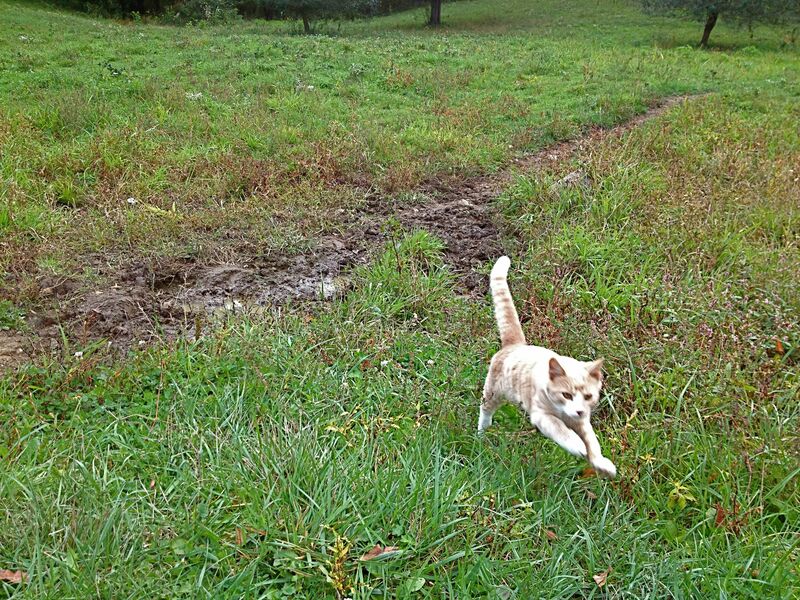 Then, when it’s time to head out, Cat comes running when I call and hitches a ride back to his home base. 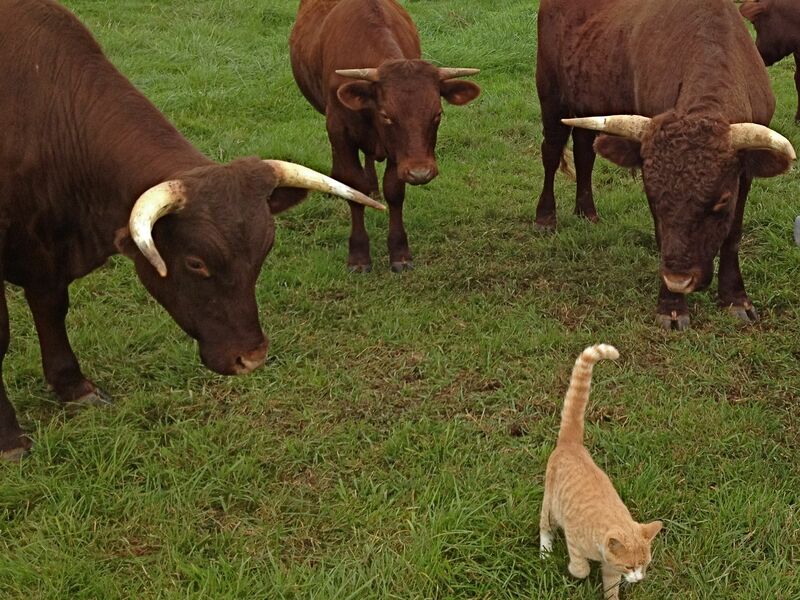 I wish I had more two-legged friends like Cat – he’s the best kind of company. So sweet. And, yes, imagine if more people had that kind of curiosity, playfulness and spontaneity? He’s a keeper! 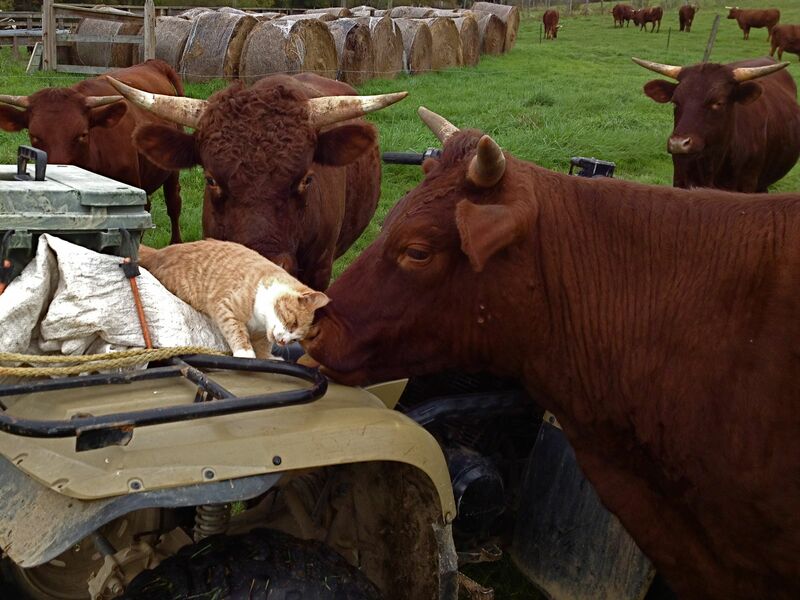 ah, cat’s awesome.. don’t you just love farm cats that think they are dogs.. I have had a few “cats” in my life and they rock! Enjoy your new friend..
It’s true – cats that act like dogs are the best, lol. Thanks Andrea, Cat is pretty adorable. Lovely post. 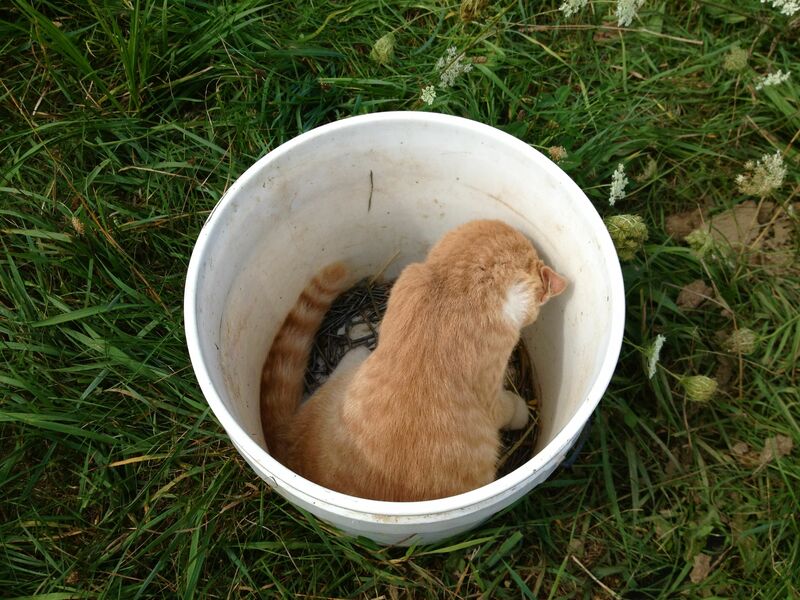 What is Cat engrossed with in the bucket? I too have a cat who supervises me for the round of morning chores and keeps me company while weeding. She is an amazing hunter, and yesterday laid out three dead bodies for my inpsection (by the door to the house, where visitors might step on them, of course) – a vole, a rat and part of a rabbit. Wow SSF, that’s quite a day’s work! The bucket was full of nails I was pulling out of some lumber I was repurposing. Cats choose you – you can’t choose them. Very true Tammy. Kind of true with all creatures really, but especially cats! Our Best Pork Sale EVER!! Our Grass-Fed Local Heritage Beef $5/lb !! 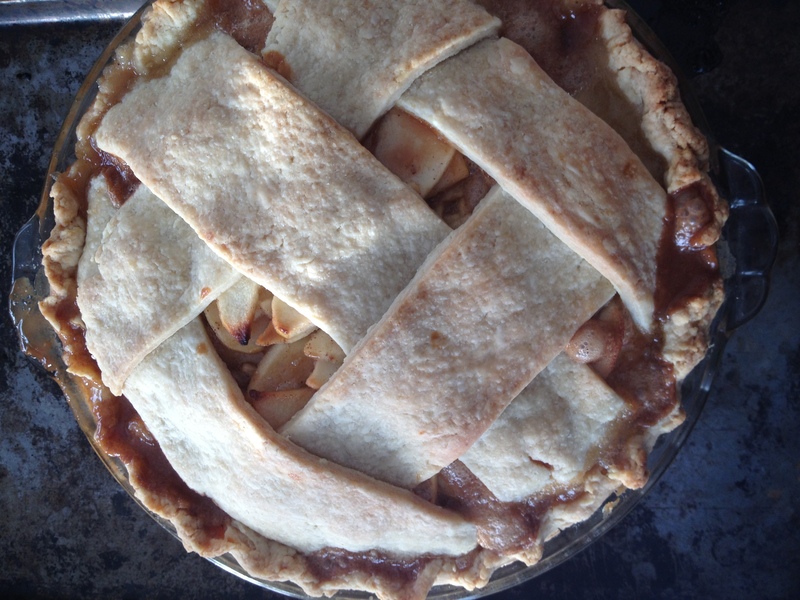 Want the latest moos, stories, recipes & photos? To get the farm-freshiest news & deals, enter your email address here. We never sell or share.